C1116. DESIRE-EMILE INGHELBRECHT Cond. 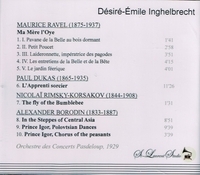 Orchestre des Concerts Pasdeloup: Ma Mere l'Oye (Ravel); L'Apprenti sorcier (Dukas); The Flight of the Bumblebee (Rimsky-Korsakov); In the Steppes of Central Asia; Prince Igor - Polovtsian Dances; Chorus of the Peasants (Borodin). (Canada) St Laurent Studio YSL 78-052, recorded 1929, Pathé-Art Label. Transfers by Yves St Laurent. "The first performance of Debussy's PELLEAS ET MELISANDE in 1902 made a major impact upon Inghelbrecht and he was to be associated with the music of that composer throughout his life. Jacques Rouche engaged Inghelbrecht as conductor at the Theatre des Arts in 1908, where he directed the first performance of Florent Schmitt's LA TRAGEDIE DE SALOME, and in 1911 he was chorusmaster for the stage premiere of Debussy's mystery-play with dance, LE MARTYRE DE SAINT SEBASTIEN; he later conducted with distinction its revival as a concert piece in 1912. In order to give Paris a first-class choir, Inghelbrecht founded the Association Chorale Professionelle in 1912 and in the same year was appointed director of music at the newly constructed Theatre des Champs-Elysees, where he conducted the theatre's opening season productions. These included Berlioz's BENVENUTO CELLINI, Mussorgsky's BORIS GODUNOV, and Dukas' LA PERI.